The world's largest private equity firm buys the island's largest apartment complex. The Summer House property was originally built to house workers during WWII. When Dorothy and her husband moved to Alameda 11 years ago, they thought they had found a safe and secure home where they could raise their children. The Summer House Apartments had recently been renovated and the rent for their two-bedroom unit seemed reasonable. Yet the couple — whose names have been changed because they fear retaliation from their landlord — and other residents say the last decade has been full of headaches due to annual rent increases, evictions, rotating property managers, and repeatedly ignored requests for repairs and renovations. Residents now fear that with the recent sale of the 615-unit complex, their situation will only get worse. Last November, property owner and global real estate investment company Kennedy Wilson announced the sale of Summer House for $231 million in what it called the "largest multifamily transaction in the San Francisco Bay Area in 2017." Dorothy learned about the sale from the Alameda Sun newspaper. She wondered, "Are they going to kick us out? Will they raise our rents? Who are they?" A letter to tenants announcing the sale did not reveal much about the buyer either. County records and state filings connected to the letters addressed to residents reveal the new owner is one of world's largest corporate landlords, the Blackstone private equity firm. Blackstone Real Estate Managing Director Olivia Hamlet signed the deed filed with the county. Hamlet did not respond to requests for comment. Wall Street's purchase of the island's largest apartment complex has residents concerned and has activated tenant advocates. Blackstone controls over $450 billion in assets. After the financial crisis a decade ago, mega-landlords like Blackstone bought up large swaths of foreclosed single-family homes and turned them into rentals. A January 2018 report by ACCE Institute, Americans for Financial Reform, and Public Advocates, "Wall Street Landlords Turns American Dream into American Nightmare," details the rent increases, surge in evictions, and poor conditions maintained by Wall Street landlords in the single-family rental market. Many of these Wall Street landlords bundled their rentals together and securitized them into "single-family rental bonds." Last May, the Securities and Exchange Commission announced it was investigating whether such bonds used overvalued property assessments. Over the past year, Blackstone has bought multifamily properties in Seattle, Denver, and in the states of Texas, Illinois, and Florida, expanding the global investment firm's 100,000-unit real estate portfolio. In addition to reports about Blackstone, Summer House tenants are also concerned about their new landlord because of Alameda's weak tenant protections and Summer House's own history. The Alameda Housing Authority developed the land, which is situated on the west end of Alameda, to house workers during World War II in 1943. The authority demolished the 760-unit Chipman Housing Project in 1958 and sold various parcels to private developers. In 1964 and 1965, Los Angeles-based Gersten Company built the Buena Vista Park Apartments. In exchange for a subsidized federal loan, Gersten agreed to keep rents below market rate for 20 years, or until it could pay off the loan. In 1987, Gersten paid off the loan and announced plans to double residents' rents. Low-income and predominantly African-American tenants protested and appealed to Gersten and the city for help, eventually resulting in Section 8 vouchers for many families. However, 325 families did not qualify for subsidies, which led tenants and housing advocates to sue the City of Alameda for discriminatory housing policies in 1989. The suit included Alameda's 1973 charter amendment, Measure A, which banned the construction of new apartments. A judge ruled that the city's policies discriminated against low-income residents. The parties settled the suit in an agreement that kept Measure A but granted an exemption to replace the 325 units lost. In 1996, Gersten filed for bankruptcy. Bank of America sold the property to Florida-based Fifteen Group. For eight years, various property management firms they controlled allowed the property to deteriorate to the point that the city appointed a special "Harbor Island Task Force" to address code violations. In 2004, Fifteen Group announced plans to renovate the property and terminated all residents' leases, forcing nearly 400 families out. At the time, residents expressed fears that the apartments would be converted to condominiums. Despite protests and a federal injunction, all the residents — including my family — moved by 2005. Kennedy Wilson bought the property in 2005 and continued the planned renovations. Since 2007, Summer House's demographics have appeared to change, not only racially but also in terms of family composition. Long-term residents noticed the neighborhood has fewer and fewer families, while single couples without children and adults living with roommates have increased. A 2016 study by the Anti-Eviction Mapping Project found that between 2006 and 2016, the highest number of unlawful detainers in Alameda — part of the legal eviction process — were at Summer House. The study did not include people displaced because they could not afford rent increases. Rent for a two-bedroom apartment was as low as $1,299 in 2010, and promotions enticed new residents with one-month-free deals. By 2015, rents ranged from $1,896 to $2,470. Monthly rents start at $2,542 for a two-bedroom unit, according to Summer House's website. Over the past three years, Alameda has been a focal point in the housing crisis and landlord-tenant battles over renter protections. Less than half a mile away from Summer House, the owner of 470 Central Avenue evicted all 33 families from the Bay View Apartments in 2015, just days after the city council adopted a moratorium on evictions. With landlord groups prepared to bankroll the local elections in November to prevent the adoption of just cause evictions or rent control in the city, it's perhaps no surprise that a corporate equity giant like Blackstone would invest in Alameda. "The sale seems to reflect regional, state, and — in the case of Blackstone — national real estate players continuing to take an interest in Alameda's West End," said Brad Hirn of the Alameda Renters Coalition (ARC). Hirn said Blackstone's entry into Alameda's rental market has tenants interested in their rights and fighting displacement in the neighborhood. Before the 2016 sale, residents began organizing themselves into the Summer House Tenants Association, with assistance from the ARC. Tenants held meetings near the complex's pool, but fear led them to meet away from the view of management. When organizers put up recruitment fliers this winter, management began inquiring about the identities of those posters, residents said. "Management does not want you to know your rights," Richard recently told meeting attendees. The 10-year resident hopes to raise his children at Summer House and wants other tenants to feel empowered enough to do so, too. In addition to rising rents, many residents expressed concerns about living conditions. At a recent meeting, residents shared tales of sewage, vermin, leaky roofs, and delayed responses to repairs over the years. Richard said he's seen mice in the hallways and "mouse droppings on our balcony." When Dorothy's husband complained about mold on the wall in her children's room, maintenance removed it the next day. "But this is an ongoing problem," she said. "It keeps coming back." Despite these complaints, the city of Alameda's Planning Department said Summer House has no unresolved or valid code violations on file — meaning any complaints filed were either fixed or were deemed to not be code violations. City officials said the only code violations found since 2013 were broken sprinklers. With rents absorbing much of their families' incomes, those who want to move can't afford moving costs. "People are literally trapped in a catch-22," explained Clair, a longtime resident. "We have housing that's not ideal, but to get out is expensive." She said new fees have been added over the years, including fees for sewage and parking. Residents have also complained about aggressive policies regarding parking, which has resulted in cars being towed. The possibility of more rent increases would be too much for Clair's family to bear, she said. "How am I going to pay more rent when this place is already maxing me out?" Representatives from the new property management company, Pinnacle Property Management, declined to comment. All of the residents interviewed for this story asked to remain anonymous out of fear of retaliation. The Summer House Tenant Association is slowly growing. Residents are canvassing their neighborhood, revealing Blackstone as the property owner, informing their neighbors of tenants' rights, and educating each other about the stakes of the upcoming November election. Some tenants are cautiously optimistic that Blackstone's new management company will provide repairs and the amenities they feel they deserve for the high rents they pay. For some, fears overshadow that hope. 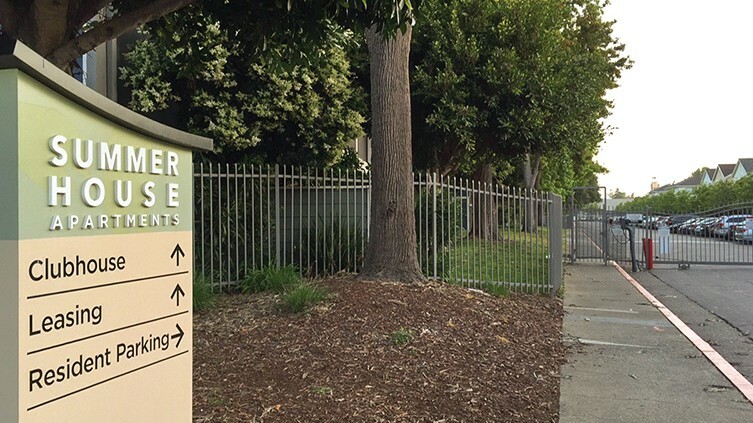 At a recent tenant meeting, a longtime Summer House resident said a family with young children who lived at the complex had to move out of Alameda entirely after their rent for a three-bedroom apartment increased from $2,695 to more than $3,000. They ended up in Richmond.